The Divine Liturgy celebrated by the Orthodox Church is called the Liturgy of St. John Chrysostom. It is a shorter liturgy than the so-called Liturgy of St. Basil the Great that is used only ten times during the Church Year. These two liturgies probably received their present form after the ninth century. It is not the case that they were written exactly as they now stand by the saints whose names they carry. It is quite certain, however, that the eucharistic prayers of each of these liturgies were formulated as early as the fourth and fifth centuries when these saints lived and worked in the Church. The Holy Eucharist is called the “sacrament of sacraments” in the Orthodox tradition. It is also called the “sacrament of the Church.” The eucharist is the center of the Church’s life. Everything in the Church leads to the eucharist, and all things flow from it. It is the completion of all of the Church’s sacraments—the source and the goal of all of the Church’s doctrines and institutions. As with baptism, it must be noted that the eucharistic meal was not invented by Christ. Such holy ritual meals existed in the Old Testament and in pagan religions. Generally speaking the “dinner” remains even today as one of the main ritual and symbolic events in the life of man. The Christian eucharist is a meal specifically connected with the Passover meal of the Old Testament. At the end of his life Christ, the Jewish Messiah, ate the Passover meal with his disciples. Originally a ritual supper in commemoration of the liberation of the Israelites from slavery in Egypt, the Passover meal was transformed by Christ into an act done in remembrance of him: of his life, death and resurrection as the new and eternal Passover Lamb who frees men from the slavery of evil, ignorance and death and transfers them into the everlasting life of the Kingdom of God. At the supper Christ took the bread and the wine and ordered his disciples to eat and drink it as his own Body and Blood. This action thus became the center of the Christian life, the experience of the presence of the Risen Christ in the midst of his People (see Mt 26; Mk 14; Lk 22; Jn 6 and 13; Acts 2:41-47; 1 Cor 10-11). As a word, the term eucharist means thanksgiving. This name is given to the sacred meal-not only to the elements of bread and wine, but to the whole act of gathering, praying, reading the Holy Scriptures and proclaiming God’s Word, remembering Christ and eating and drinking his Body and Blood in communion with him and with God the Father, by the Holy Spirit. The word eucharist is used because the all-embracing meaning of the Lord’s Banquet is that of thanksgiving to God in Christ and the Holy Spirit for all that he has done in making, saving and glorifying the world. The sacrament of the eucharist is also called holy communion since it is the mystical communion of men with God, with each other, and with all men and all things in him through Christ and the Spirit. The eucharistic liturgy is celebrated in the Church every Sunday, the Day of the Lord, as well as on feast days. Except in monasteries, it is rarely celebrated daily. Holy Communion is forbidden to all Orthodox Christians on the week days of Great Lent except in the special communion of the Liturgy of the Pre-sanctified Gifts (see below) because of its joyful and resurrectional character. Baptism in the Orthodox Church are because they are joyful events joining new members to the Body of Christ, are public events at St Innocent's. Almost all Baptisms take place during the Divine Liturgy on Sunday or another Feast day. Only for extraordinary reasons would we celebrate a Baptism "privately." We expect that children who are Baptized will be reared as members of the Church, with Sponsors and parents seeing to it that the child is raised in a Christian home and is brought to services and to Communion regularly. To do anything less is a great disservice to the child. For this reason, Baptisms are typically performed for persons who are members of St Innocent's parish, with Sponsors/Godparents who are known to be practicing, faithful Orthodox Christians. The following directions, from the Guidelines for Clergy (Orthodox Church in America, 1998), address various issues surrounding the celebration of Baptism and are considered normative for our practice at St Innocent's. Baptism and Chrismation must be understood and experienced as corporate acts of worship and praise. The must be communal actions of the Church as the mystical Body and Bride of Christ, common liturgical actions of the whole people of God, witnessed, celebrated and accomplished by all, together in one place, at one time. See: On the Spiritual Life in the Church, Encyclical Letter, Holy Synod of the Orthodox Church in America, 1988. Baptism is normally performed in the temple. In the case of an adult baptism, the rite may take place outdoors at a suitable aquatic site. Preferably, each deanery should have at least one large baptismal font designed for the immersion of adult catechumens. The candidate for baptism should bear the name of a recognized Orthodox saint. This matter should be discussed with the prospective parents long before the birth of the child. 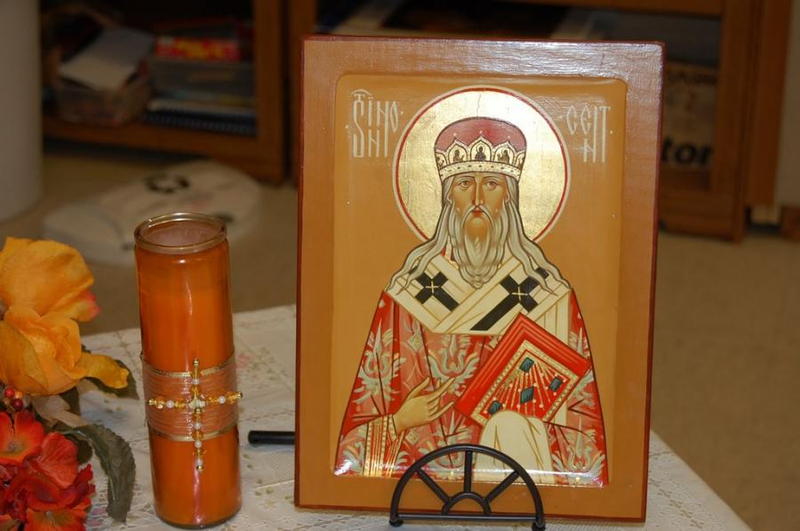 An adult convert to the Church should also bear the name of an Orthodox saint, especially if the name given at birth is unusual to the Orthodox tradition. The Mystery of Holy Baptism is administered in full accordance with the Office of the Service. No exorcism or prayer is to be shortened or omitted. 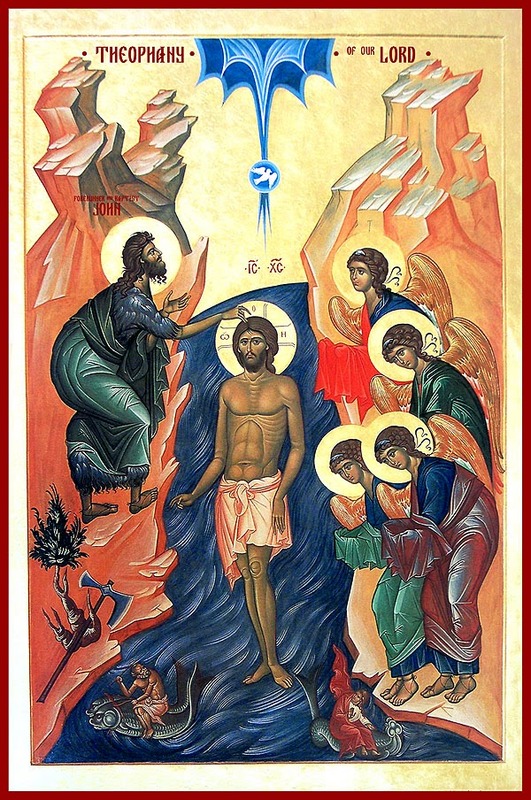 Baptism is properly performed by triple immersion; therefore, mere pouring is not normally permitted. It is necessary to have a font large enough for full immersion. The final step in Christian Initiation is the partaking of the Holy Eucharistic Mysteries. In the instance of Baptism or Chrismation, it is desirable that the newly illumined receive Communion as soon as possible from the chalice, during the Divine Liturgy, and not from the reserved sacrament. The sponsor of a candidate for Holy Baptism is a guarantor to the Church that the person will be reared and/or educated in the Orthodox faith; he/she must be a practicing member of the Orthodox Church. A person can guarantee only that which he/she possesses and practices; therefore, a non-Orthodox is unable to guarantee sponsorship because he/she has neither the faith nor the practice. The sponsor should be of the same gender as the candidate. A worthy sponsor is already leading a full sacramental life, confessing sins through the Mystery of Penance and receiving Holy Communion. The priest is to instruct the parents and the sponsors of their respective obligations to the catechumen, and to exhort them to live a full sacramental life. The sponsor, as well as the parents, should be prepared to receive the Eucharist at the time together with the newly baptized person. A person who has excommunicated himself/herself, or has been suspended from reception of the mysteries by a hierarch, for whatever reason, is ineligible to be a sponsor. The child’s parents or an adult catechumen may request that a non-Orthodox person witness the mystery. That person may be present and considered an honorary witness if there is no negative or scandalous deterrent. This person, however, is not the sponsor of the candidate or the Godparent. The priest must enter the required data in the parish metrical book after carefully ascertaining all necessary information that includes checking all facts and spelling for accuracy and completeness. The following directions, from the Guidelines for Clergy (Orthodox Church in America, 1998), address various issues surrounding the reception of converts and are considered normative for our practice at St Innocent's. An observant Orthodox life requires regular and frequent Confession. Persons who commune regularly should be confessing regularly, as well. Persons who commune infrequently will need to confess before receiving Communion. Fr Alessandro is available to hear Confessions every week on Saturdays before and after Great Vespers, and before and after Divine Liturgy on Wednesday morning, or by other arrangements. Click here for our Basic Guide to Confession. The following directions, from the Guidelines for Clergy (Orthodox Church in America, 1998), address various issues surrounding Confession (the Mystery of Penance) and are considered normative for our practice at St Innocent's. Confession, the mystery of reconcilliation with the Church, must be regular and frequent. It must be an abiding element in the lives oif the faithful, deformalized and revitalized as the most common and normal actions of a people continually united and reunited with each other and with God. See: On Spiritual Life in the Church, Encyclical. The priest, as spiritual father and confessor of the flock entrusted to his care, must determine the frequency with which the spiritual child confesses his/her sins. For those who seldom receive Holy Communion, the priest must keep in all its strictness the obligation for confession before communion. However, if someone wants to confess more often than he/she communes, the Spiritual Father should be prepared to hear that person’s confession at all times. For reception of Holy Communion more than once a month, Confession must be on a regular basis, and heard not less than once a month. If General Confession is practiced, then the Order of Prayers before Confession must be read. The General Service of Prayers Before Confession is not meant to replace or be a substitute for personal confession. The clergy are reminded that they must also avail themselves of the Mystery of Penance regularly and faithfully. The priest who does not have a Spiritual Father upon beginning his priestly ministry must seek one. If he cannot find one, then he must turn to his hierarch to appoint one for him. In some instances, there is a senior priest who has been appointed by the hierarch as diocesan confessor to whom the priest can turn. The secrecy of the Mystery of Penance is considered an unquestionable rule in the entire Orthodox Church. Theologically, the need to maintain the secrecy of confession comes from the fact that the priest is only a witness before God. One could not expect a sincere and complete confession if the penitent has doubts regarding the practice of confidentiality. Betrayal of the secrecy of confession will lead to canonical punishment of the priest. St. Nicodemus the Hagiorite exhorts the Spiritual Father to keep confessions confidential, even under strong constraining influence. The author of the Pedalion (the Rudder), states that a priest who betrays the secrecy of confession is to be deposed. The Metropolitan of Kos, Emanuel, mentions in his handbook (Exomologeteke) for confessors that the secrecy of confession is a principle without exception. The testimonial given by the Spiritual Father before an ordination does not constitute an exception. If the confessor discovers an impediment to ordination, he is not obligated to deliver the testimonial, and does not need to provide any reason for justifying his refusal. The following directions, from the Guidelines for Clergy (Orthodox Church in America, 1998), address various issues surrounding the celebration of Marriage and are considered normative for our practice at St Innocent's. The Church’s vision of marriage is as an icon of the Trinitarian life of God Himself. In such a union, human love and desire for companionship become a love pervaded and sanctified by Divine Grace. God unites in body and spirit, heart and mind. Love unites in such a way that two lives become one life in perfect harmony. Such love implies a relationship in marriage that is total in character. To live up to its high calling, the Christian family must be firmly established in the faith. See: On Marriage, Encyclical Letter, Holy Synod of the Orthodox Church in America, 1976. The priest must make sincere and determined efforts through preaching and teaching to make his parishioners aware that the Mystery of Marriage takes place within the context of the total life of the parish. The rector must seek to know who among his parishioners intend to marry and must make himself available for guidance and advice. His responsibilities include instructing the couple on the Orthodox Christian teaching of marriage. This should take place well before wedding plans are made so that the couple may understand and follow the Church’s teaching and discipline on the Mystery of Marriage. • Procreation of children is not in itself the sole purpose of marriage; nevertheless, marriage presupposes a desire to have children. The couple should pray for God to grant them the blessings of childbirth and wise nurturing of the family.• "Let marriage be held in honor, and let the marriage bed be undefiled" (Hebrews 13:4).Sexual union is one of the blessings of marriage. The priest should remind the couple that they belong to each other. Couples may abstain from sexual union for a season by mutual consent, but should be made aware that refraining entirely from this act may result in unnecessary difficulties in their marriage. The priest should make known to his faithful that before setting a date, renting a hall, or considering any activity related to the social aspect of the marriage day, a couple planning marriage must first seek the blessing, guidance, and advice of their parish priest. The couple must respect the seasons, times, and days during which marriage may be blessed. The priest must also uphold the teaching of the Church in regard to these things. The most appropriate time for a wedding is Sunday, following the celebration of the Divine Liturgy. • on the evening and day of the Elevation of the Cross (Sept. 14). Because marriages are normally celebrated on Sunday after the Divine Liturgy, the request to hold the ceremony on a Saturday requires a written petition for consent to the diocesan hierarch by the rector of the church where the marriage is to be performed. The couple must be exhorted to attend the Divine Liturgy on the following Sunday so that the marriage can be sealed by the reception of the Holy Eucharist. If permission is given for a Saturday wedding, it shall be celebrated no later than a time of day established by the hierarch so that the priest may serve the Vigil or Vesper service. The ritual of the marriage ceremony is to be celebrated in an Orthodox Church building. Halls, gardens, and other places are not appropriate. The priest, as a pastor of souls, must also be available to counsel those already married, who are experiencing difficulties in their married status. The priest is responsible for entering into the metrical book the required information. A mixed marriage is a marriage between an Orthodox Christian and a non-Orthodox Christian who is baptized in the name of the Father, the Son, and the Holy Spirit, and who confesses the unique Lordship of Jesus Christ. The Church tolerates this because of her pastoral concern and love for the faithful. Thus, a mixed marriage is not the norm, but is permitted in the hope that the non-Orthodox spouse will seek entrance into the Church. A petition for a mixed marriage must be submitted to the diocesan hierarch for his blessing. In a mixed marriage, the Orthodox partner should not consent to have children of the union baptized outside the Orthodox Church as a pre-marriage agreement. Toleration of a mixed marriage does not extend to marriage between an Orthodox Christian and a non-Christian person, such as a Christian Scientist, Jehovah’s Witness, Jew, Mormon, Moslem, Unitarian, etc. Active participation on non-Orthodox clergy in this service, as in all the mysteries of the Orthodox Church, is not allowed. Conversely, Orthodox clergy may not participate in Non-Orthodox services and rites. The Orthodox norm for those who marry is one marriage. A second marriage is tolerated under certain conditions. A third marriage is extended under certain precise circumstances. The Church does not grant divorces. However, it recognizes that because of human weaknesses and sin marriages sometimes disintegrate and are ended by civil decree (divorce). Under no circumstances can there be a fourth marriage. • If one party of the marriage is being married for the first time (even if that person is not Orthodox), the order of the first marriage is used. • If both the partners are divorced and/or widowed, the order for the second marriage is used. Orthodox Christians who marry outside the Orthodox Church thereby exclude their marital life from the life of the Church, exclude themselves from participation in the Holy Eucharist, and therefore exclude themselves from full membership in the Church. Such persons, after a period of penance, may be restored to Eucharistic fellowship by recommendation from the priest and on the approval of the hierarch. Normally, such an act of restoration includes the confirmation of the marriage through a rite approved by the hierarch. But I do not want you to be ignorant, brethren, concerning those who have fallen asleep, lest you sorrow as others who have no hope. For if we believe that Jesus died and rose again, even so God will bring with Him those who sleep in Jesus. For this we say to you by the word of the Lord, that we who are alive and remain until the coming of the Lord will by no means precede those who are asleep. For the Lord Himself will descend from heaven with a shout, with the voice of an archangel, and with the trumpet of God. And the dead in Christ will rise first. Then we who are alive and remain shall be caught up together with them in the clouds to meet the Lord in the air. And thus we shall always be with the Lord. Therefore comfort one another with these words (1 Thess. 4:13-18). The Church has no specific rules determining the length of time between death and the burial. Interment varies according to the climate, civil ordinances, customs, and circumstances, and may be held immediately following death, or after a number of days. The hour of interment is also not fixed; it may be at any time during the day to accord with cemetery regulations and parish needs. It is assumed that, unless the death was an accidental or untimely one, the priest has been ministering to an aging person, or one suffering from some ailment or sickness, and has prepared the person for death through participation in the Mysteries of Penance and Holy Eucharist. The priest should read the Prayers at the Departing of a Soul and passages from Holy Scripture. Merely to be present at the bedside of one’s spiritual child and not minister with audible prayer is unworthy of the priesthood. If the priest was not at the bedside of the dying parishioner at the time of death, he must make contact with the family, offering to assist them through the time of grieving and mourning. The Service for the Departed (panikhida) is sung on the eve of the burial whether the body is in the temple, funeral home, or elsewhere. The body of the departed may be brought into the temple at any time prior to the time of the Funeral Service, whether days before or on the day thereof. According to traditional practice, the casket is open from the first Service for the Department (panikhida) until the conclusion of the Funeral Service. The deceased is made in the image and likeness of God; the physical body is not to be shunned or rejected because it is in an altered state. To view the body at the funeral home but not in the church is illogical. The casket is positioned so that the feet of the departed are toward the iconostasis. Thus, the person, if alive, would be standing facing the Holy Altar. The Funeral Service is usually served in the temple on the day of the burial. The Divine Liturgy may be celebrated on the day of the Funeral Service. This takes place before the Funeral Service. Celebration of the Divine Liturgy is precluded during the Great Fast when the weekday liturgy is not celebrated. The Funeral Service and burial is generally not officiated on Sunday or Pascha. If the Funeral Service is scheduled for Monday, the body may be brought into the temple only after the service of Vespers on Sunday evening. There may be circumstances for which immediate burial may be necessary, and in this case pastoral discretion is to be used. 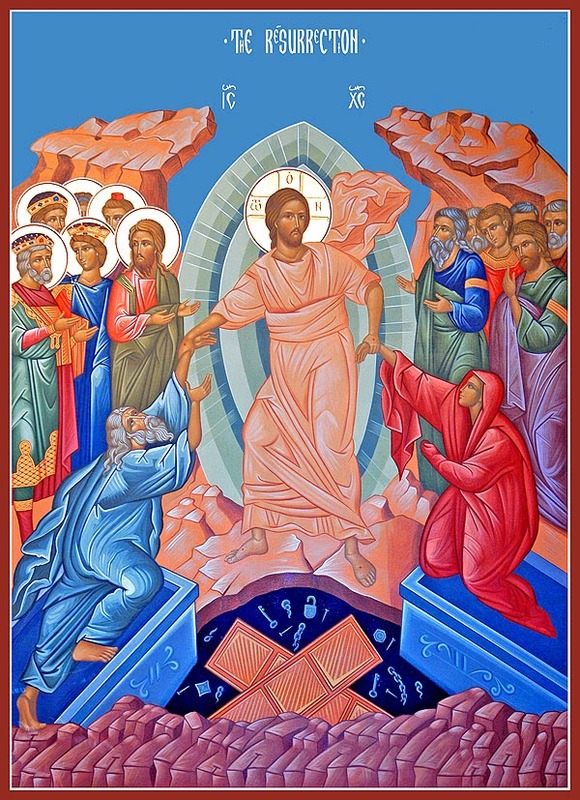 Between the day of Pascha and the Sunday of St. Thomas, the Funeral Service follows the Typicon for these specific days of celebration. An Orthodox clergyman may not take part in a service for a non-Orthodox deceased person even if that person is related to a parishioner. If invited, however, he may offer some words of consolation at the graveside or funeral meal. Non-Orthodox clergy may not be invited to participate in the Funeral Service or offer any form of homily or public statement in the temple, or participate in the graveside service. The officiating priest, however, cannot control what takes place after the Orthodox service of burial has been concluded in a public cemetery. Prayers for the dead are usually offered immediately after the burial at the memorial meal, on the third, ninth and fortieth day after death, and every year thereafter. Saturday is the usual day for a memorial service. It can be scheduled immediately before the Vigil or Vesper Service. In this way, the prayers for forgiveness and repose preceding these services are illumined through the proclamation of the Lord’s Resurrection in the hymns that are sung in the following services. However, the Service for the Departed (panikhida) may be served after the Sunday Divine Liturgy if the hierarch has given his blessing for this to take place at that time. The Church has set aside definite days on which remembrance of the dead should take place. Among these are Meatfare Saturday, the second, third and fourth Saturdays of the Great Fast, the Saturday preceding Pentecost, and St. Demetrius Saturday. In addition to these specific times, the faithful may have the names of the deceased remembered at the Proskomede and during the Divine Liturgy. Memorial services are not permitted on feast days or from the Nativity of our Lord to Theophany, and from Palm Sunday to the Sunday of St. Thomas. The rector is responsible for entering into the metrical book the required information about burials. Membership in the Body of Christ, His Holy Church, is defined by participation in the Holy Eucharist. Inasmuch as a person, by refusing to partake of the Divine Body and Blood of Christ during his/her lifetime, has chosen freely not to be incorporated into the Body of Christ, unless there is reason to assume that the person has returned to Christ at the end of his/her earthly existence, that person will not be buried from the temple. The burial service of such a person should only be a Service for the Departed (panikhida), including scripture readings for the dead. The priest may be vested in the epitrachelion. If a priest is asked to bury a non-Orthodox person, he must consult with his diocesan hierarch, and with the hierarch’s blessing bury the person according to the service prescribed in the Book of Needs. The act of suicide is a profound tragedy affecting a parish. It necessitates prayers for forgiveness for the sake of the departed and exhorts the members of the parish community to repentance and sorrow. The Orthodox Church normally denies a Church burial to a person who has committed suicide. However, factors bearing on the particular case may become known to the priest who must share this information with the diocesan hierarch; the hierarch will consider the factors and make the decision concerning Funeral Services. If a parish priest is aware that a member of his flock is a Freemason, he should make it a pastoral concern to speak privately with the person, showing the incompatibility of Orthodoxy with Freemasonry. When a communicating member of a parish falls asleep in the Lord and that person is also a member of one of these societies, the priest will show love and concern for the deceased. In his counseling of the bereaved family he must not be hostile, but must inform the family that only the Funeral Service for an Orthodox Christian will be served. Patiently and tactfully, and with discretion, he will state that no words or symbols other than those of the Orthodox faith can be introduced into the church or the funeral home. The Church does not intend to control or prohibit others from executing particular rites after the Funeral Service which may take place after the priest leaves the burial site after committing the body to the ground. The practice of cremation is not a Christian one and is to be discouraged. Cremated remains are not to be brought into the temple for a burial service or for any other reason. The priest should be sufficiently informed to help guide the faithful in this area of medical procedure. Some people think that they cannot refuse an autopsy to be performed on a loved one. No one is obliged to give approval for this procedure. Unless there is a specific legal reason, such as determining the cause of death, an autopsy ought to be avoided. The desire for scientific information through experimentation is not enough reason to merit an autopsy. Nevertheless, this is a decision that the family itself must make. The Church is concerned that respect for the body as a temple of the Holy Spirit be maintained. Donation of body organ(s) after death may be allowed as long as respectful care is exercised toward the body before, during, and after the extraction operation. Care must be taken that the organ(s) are given as a gesture of altruism, free of any commercial overtones. The Church does not consider the sharing of organs as a lessening of the presence of the Holy Spirit in the deceased, or as a transmigration of part of the donor to the recipient. A healthy person not in expectation of imminent death may donate non-vital organs as long as his/her quality and integrity of life is not diminished or endangered. The following directions, from the Guidelines for Clergy (Orthodox Church in America, 1998), address various issues surrounding the celebration of Holy Unction and are considered normative for our practice at St Innocent's. The services of healing through anointing of the sick must be understood and experienced as corporate acts of worship. See: On Spiritual Life in the Church, Encyclical, page 5. The Mystery of Holy Unction is administered to Orthodox Christians for the healing of soul and body. It may be for a particular person or for a number of persons gathered together. While especially appropriate for the sick and dying, the Mystery of Holy Unction is intended for the living. Those who are already dead must not be anointed with this Holy Unction. It should be understood that the service is primarily for those who are ill in body and in soul and are able to be present if the service is performed in public. Otherwise, the priests ought to go to the bedside of the person for whom the healing is sought. This mystery is bestowed on those who have confessed and are at peace with God in their souls. One cannot expect to receive healing without repentance; confession precedes the healing. If it is not possible to use the full order of service to anoint a person who has fallen ill, an abridged form that has been approved for use by the diocesan hierarch may be used. In some dioceses, deaneries, and parishes, for the benefit of the local Orthodox community, it has become a custom, although not prescribed by the Typikon, to celebrate this mystery on fasting and festal seasons. 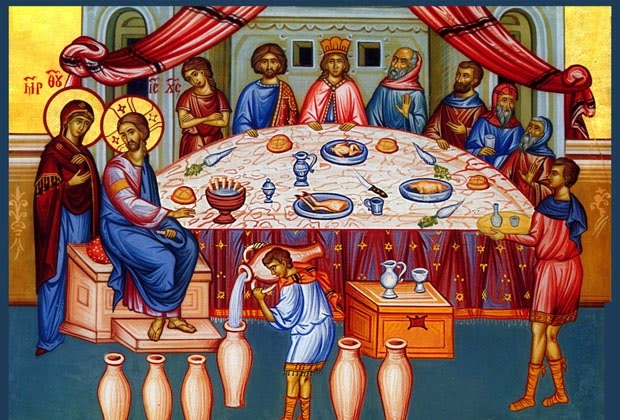 Although it is not prescribed in the Triodion, one such example is the celebration of the mystery on Great and Holy Wednesday for the entire gathered community. Normally, oil which has been sanctified at a previous celebration of the Mystery of Holy Unction is not reserved for the subsequent anointing of the sick, but should be burned in an oil lamp or poured over the body of the person for whom it had been offered if that person dies. The custom of allowing the faithful to take oil home with them to anoint others should not be encouraged since the usual ministrant of the Mystery of Holy Unction is of the priestly rank. If garments and the like are brought forward at the service, they may be sprinkled with holy water, but should not be anointed with the sanctified oil.